This is an aerial photo of the Beaver Pond area that is currently under heated debate between the developer, the city, and the local residents of Kanata North. The photograph is accurate to approximately one pixel per meter in the high resolution image. 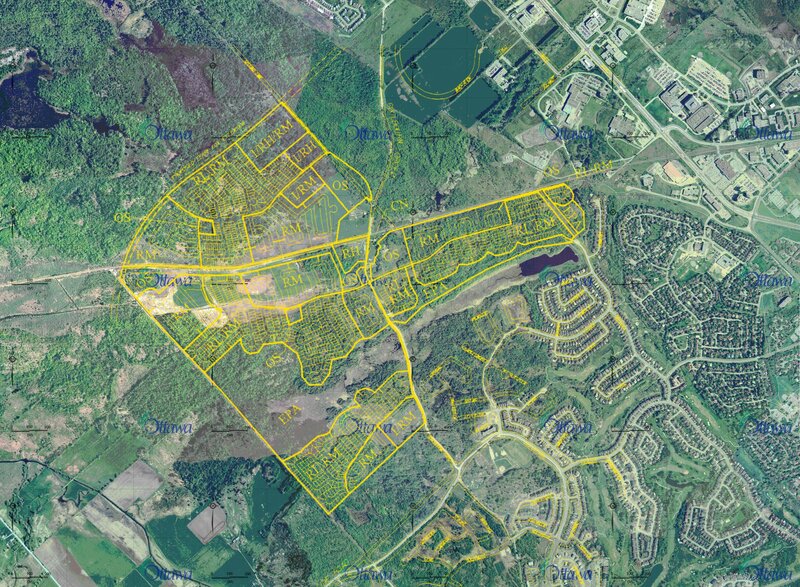 It is hoped that this overlay can give the residents a better idea of what areas of the environment will be destroyed; the black and white map outlines do little to show features people are familiar with. In this photo one can see treelines, paths, various natural clearings, and a much better feel for what will be left if this plan is approved. Photograph is from 1999, and is outdated regarding the development along the south end of Walden Drive, toward Castlefrank (Kanata Avenue). Also missing is the 4 hectares of accidental clearcutting south-west of Goulbourn Forced Road. 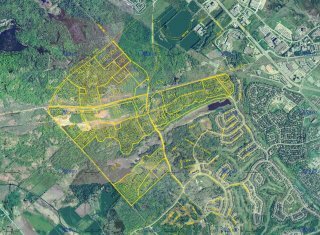 The clearing to the north of Trillium Woods and south of Hines Road is now occupied by the Kanata North Technology Park. The overlayed (yellow) image is marked NTS ("Not To Scale"), though it appears to match the photo closely without any change in proportions. All source materials are copyright City of Ottawa. -- Pat Suwalski, Walden Drive.